Surrounded by her beloved airedales, Baldur, Undine, and Siren-at first glance Christian Waller looks like a fairy princess. Her life -less so. 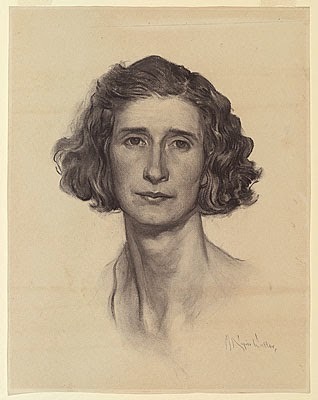 An artist in her own right, she married fellow student Napier Waller, and both studied at Melbourne's National Gallery School. She was 38 at the time. 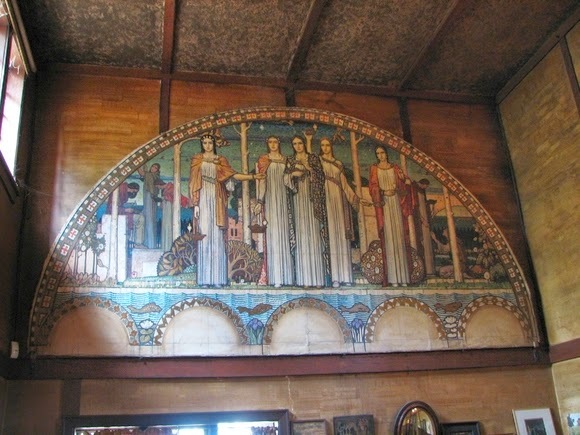 Hanging over a massive fireplace in the Waller's Melbourne dining room, the painting is her husband's only major canvas work and mural size (4 feet x almost 7 feet wide). 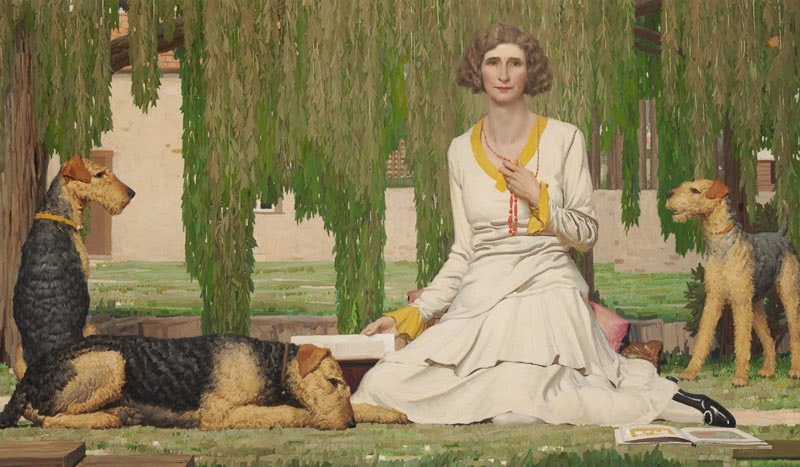 Experts interpret the painting's composition in hindsight, noting five years after the portrait was completed Christian had a breakdown and the couple's marriage suffered estrangement though the pair remained married til Christian's death in 1954. 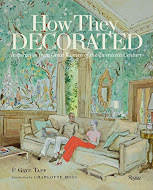 There must have been moments of sweetness though when Christian was sitting on the lawn of her Arts and Crafts bungalow, fashionably dressed in white, amongst her dogs and some of her own illustrated books. She fidgets with her coral beads -a habit or a possible response to Baldur's barking. 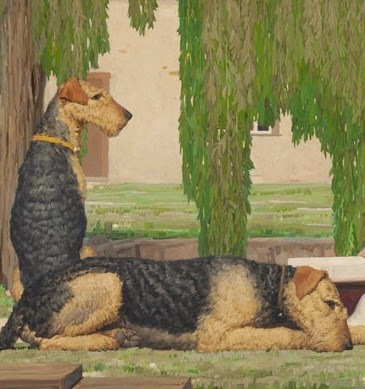 The other two airedales are at rest and at attention-completing the framework of the portrait. A heavy draping of willow leaves cools the scene-perhaps casting a shadow on unnamed auguries . 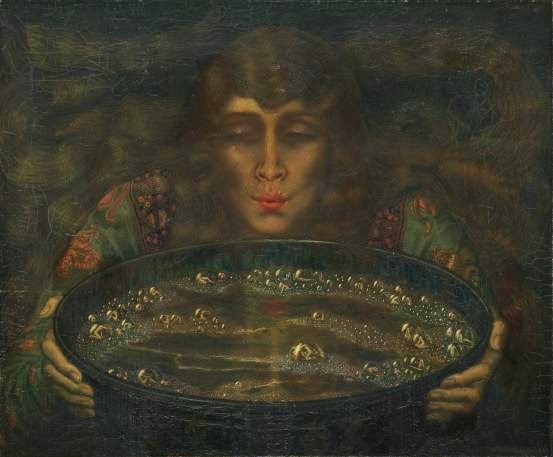 "There is often greater martyrdom to live for the love of, whether man or an ideal, than to die"
Christian's own work was influenced by the Pre-Raphaelite and Art Nouveau in the early 1920's. She studied both Classical and Medieval works as a student- all contributors to her maturing style. 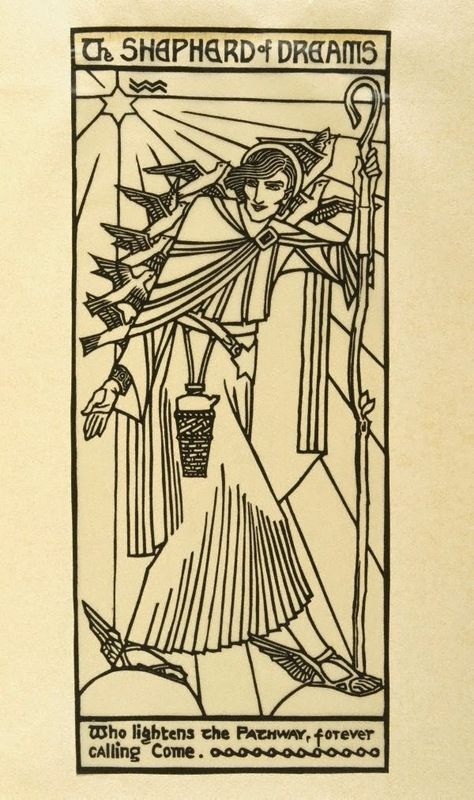 In the 1930's Art Deco dominated her work-her prints, book designs and stained glass. After her breakdown, she turned deeper into Theosophy-shutting herself off from the world at large. Studio portrait of 20178 Private (later Bombardier (Bdr)) Mervyn Napier Waller, of Hawthorn, Vic,1915. Napier Waller was a World War I war hero -giving his right arm on the Western Front to the cause. Self taught afterwards-with his left hand, the city of Melbourne has been described as "a gallery of Napier Waller’s work." 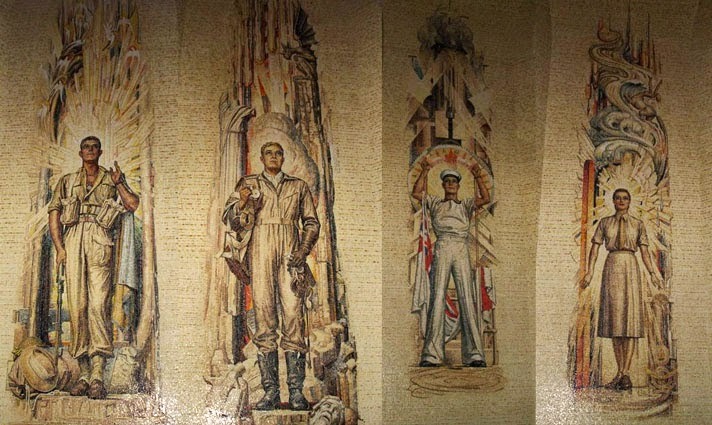 Working in stained glass and mosaics, Waller completed works for the Hall of Memory at the Australian War Memorial, Canberra, completed in 1958. Along with these compelling works there are eleven monumental Waller murals in the central business district in Melbourne and at the University. There is an omnipresent, eternal, boundless, and immutable reality of which spirit and matter are complementary aspects. There is a universal law of periodicity or evolution through cyclic change. All souls are identical with the universal oversoul which is itself an aspect of the unknown reality. 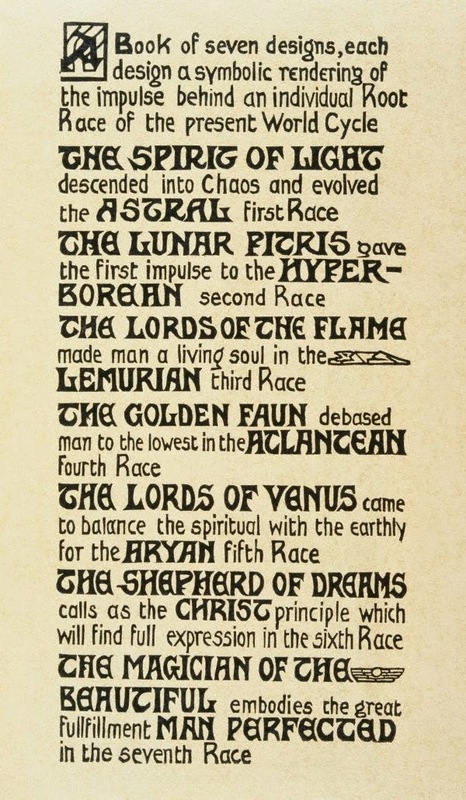 While critics have proven Blavatsky was part a charlatan and her supposed experiences with the paranormal faked- in the world Christian Waller inhabited they were real. 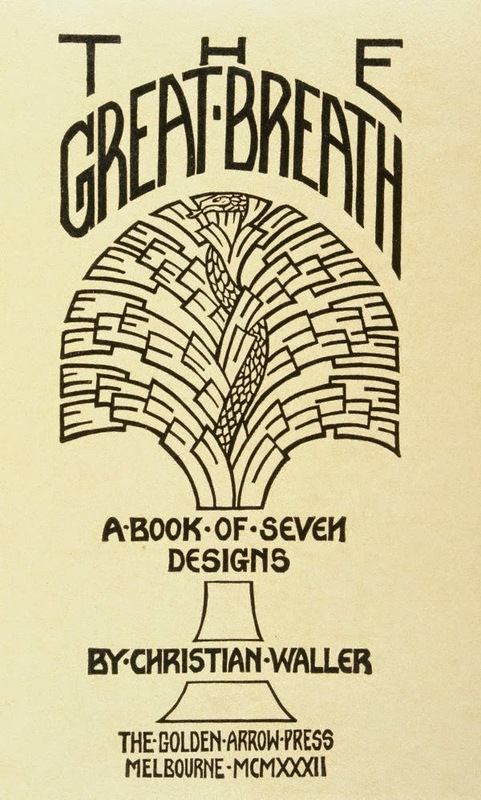 Christian's book The great breath; A Book of Seven Designs (1932), is testament to her beliefs. "all aspects from the cutting and printing of the linoblocks to the manufacture of the distinctive gold-painted emerald green cover was done by hand. 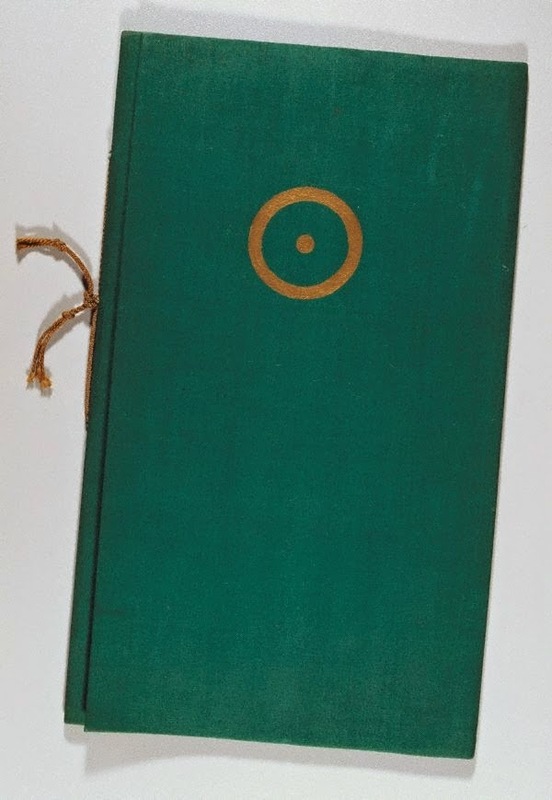 She printed the blocks on her 1849 hand-press in her studio at Ivanhoe, each book taking about four days to make, hand-bound with green cord. Although it was intended to produce an edition of 150, it seems only about 30 were made. Designed by the Wallers as home and studio, Napier Waller lived in the house fifty years and examples of his art and work, Christian's work, that of his second wife, and Christian's niece, famous studio potter Klytie Pate, remain suspended in time-just as Napier left them. Today the house is a private residence maintained and lived in by a Melbourne antique dealer. From Steven Miller's book Dogs in Australian Art, we are told visitors to the Waller home remember the first thing they heard was 'Baldur's deep bark and the scuttering of claws on the polished wood floor.' 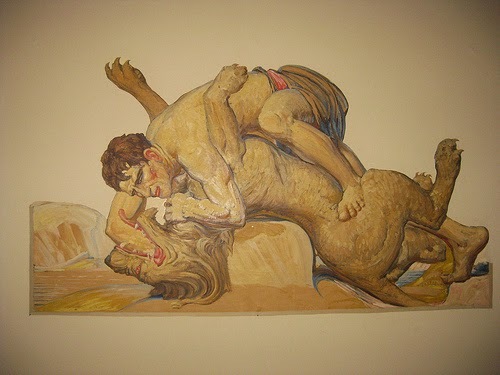 Napier Waller would feature his Airedale in several allegorical murals- the breed seemed to lend itself to Waller's Art Deco palette-so with the Waller's home. Mural was originally commissioned for the Menzies Hotel, Melbourne (now demolished). in The Blue Room of the Waller House, a guest room with built in glass topped furniture. 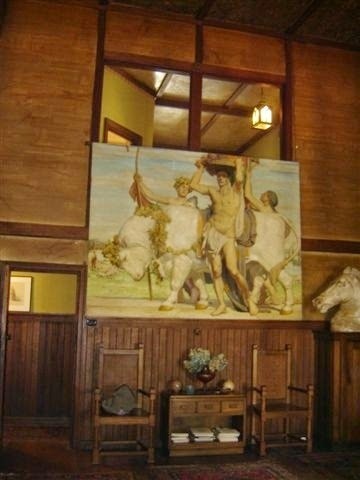 Once acting as their Studio when the house was built, the living room holds Waller's Study for “The Five Lamps of Learning" and "Peace After Victory." The room is panelled and floored in Tasmanian hardwood, the walls are plastered and finished in a combed wood pattern, and the raftered ceiling is in a marble pattern of gold leaf. There is a musician's gallery overlooking the whole. 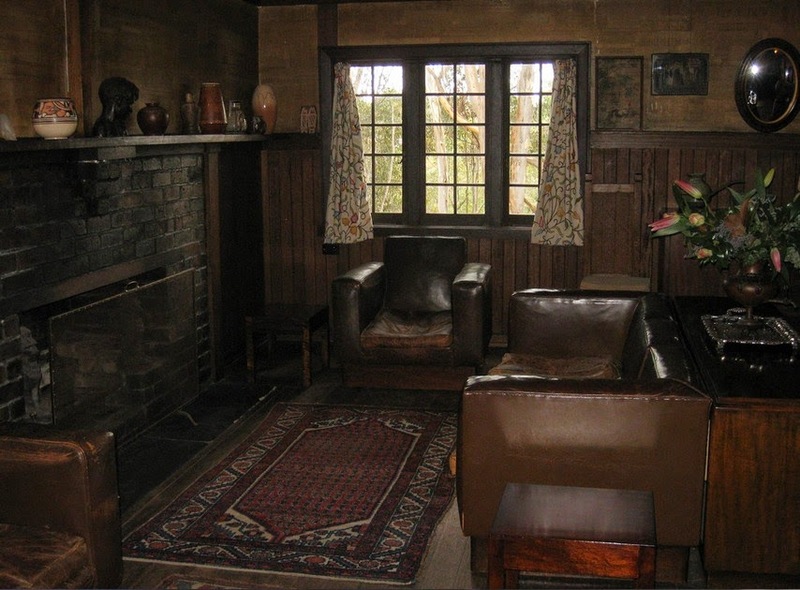 A coolness pervades in the house-the dark timbers, well worn leather and simple crewelwork curtains echo the Art Deco palette of both Napier and Christian. Like Christian's Morgan Le Fay, her life is veiled in conjecture. That they were alike-not so much, but today both remain fixed by the artist in magical worlds unlikely to be disturbed by the hand of humankind. 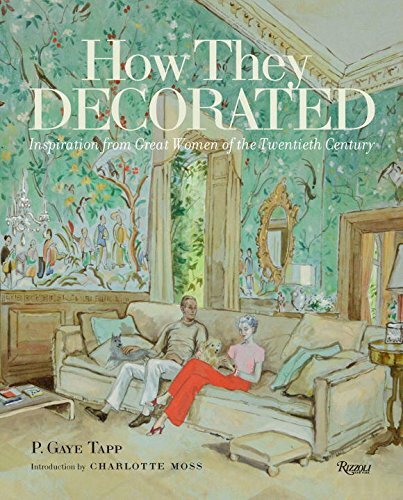 There are extensive and detailed photographs of the Waller home and an in depth bio of the couple and the house-highly recommended HERE. Several of the images of the interiors can be found there. How I wish you lived nearby...I would have loved to sit under the Blood Moon last night, reading that marvelous book illustrating the 7 Aspects of Enlightenment of Man. 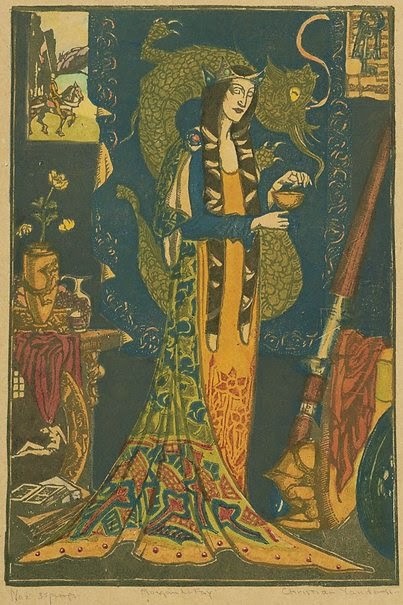 7 is such a powerful number...how you must have felt the sway of the Moon to post a forgotten Artist and her Husband, both I am sure much admired in the sphere of those in the KNOW! Gaye this feature is so fascinating and the art so incredible. I want to take time to look through the resources and articles you have listed. Thank you. Wondrous post Gaye. I really enjoyed it. Had not heard of them. A fantastic post that, once again, has sent me on a journey of discovery. I think that Einstein and quantum physics has proved quite a bit of what theosophy was talking about relative to interconnectivity?? Thank you for introducing me to the Wallers. I like the distinctive work of them both, and especially the portrait of Christian. Napier's fine work, done after he retrained his brain, is a testament to the vast untapped resources in us all. I love this post. I am thrilled to have discovered Little Augury, and working my way through your back list! It's far from her intent, but stumbling on this richness (the big portrait, photos of the room that would be the studio, and that hand-printed and bound book - and the dogs and the rest of your blog) makes me think of Blavatsky's "one thing affects another one, even at great distances" - thank you sincerely for such a fine place to visit!! Wonderful post about a subject that is new to me. Thank you for sharing your knowledge. 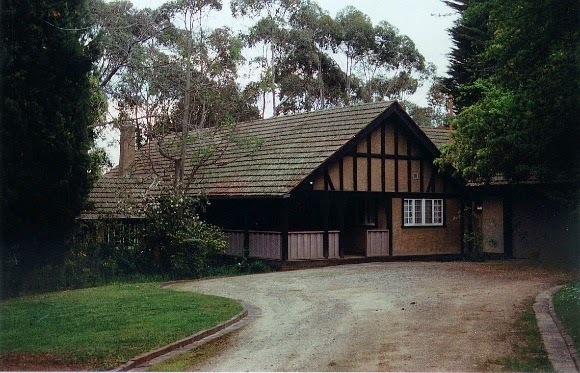 The exterior of the house is familiar to me - it is used as the home/medical office of Dr. Blake in the Australian mystery series Dr. Blake. 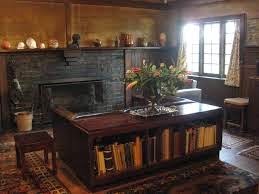 I do not know if the interiors are shot in the house, but Dr. Blake's home has an art studio that belonged to his deceased mother and it has gold leaf on the ceiling. For me the house is very much a character in the show. I looked this up to confirm it, and found that the house now is owned by the local council and is available for tours. That just might motivate me to journey to Melbourne.